Injuries: Split chin open falling over Burnett Down @ SouthGate – my first real derby injury! Twisted ankle while falling and having fingers run over. Cold cocked by a Philly Rollergirl – luckily no broken jaw. Don’t know what I did to my back, but it is all jacked up! Many, many, many bruises, scrapes, and bumps. Bio: “Smash the State – Learn to Skate” This is the world (or should I say worlds) in which she lives. Fanning the flames of revolution wherever her wheels take her, she is constantly striving to free her fellow citizens from the clutches of the RCRG. Each world a unique crisis. Each world a unique team of villains. Each world a unique aspect of Sybil Unrest manifests, though always with a common goal: to bout and destroy. With the help of her fellow Derby Liberation Front commandos, the likes of the Throttle Rockets, Grave Danger, and the Sockit Wenches will be vanquished into the mists of obscurity. 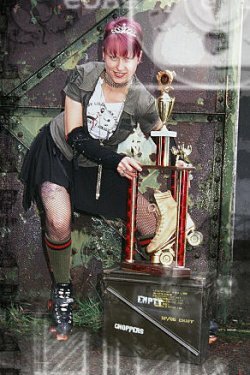 Godspeed Sybil, and never forget The Way – For the Skaters, By the Skaters, to GLORY! !